Toronto FC with another “bye” weekend – meant they couldn’t find a way to lose but also means they’ve played just 7 league games so far while some others in MLS’ Eastern Conference have played ELEVEN times already. At some point schedule congestion and World Cup absentees could come back to pile on the misery for Toronto. Misery is what the Montreal Impact and their fans are experiencing right now – another loss, this time 3-0 at home to Sporting KC dropped the Impact to 1-3-5. The loss brought out the boo birds in Montreal and more ominously for the future of head coach Frank Klopas the following from team owner Joey Saputo. Nos supporters méritent mieux. Il y aura des changements, je vous le garantis. Our fans deserve better. Changes will be coming, guaranteed. Only appearing to be short handed right from the opening kick off the Impact did really go down a man after a 17th minute red card to midfielder Collen Warner. A Matt Besler long throw bounced in front of Troy Perkins’ net, and as Uri Rosell tried to capitalize, Warner fell and pawed the ball away from the line leaving referee Jair Marrufo no choice but to produce the red card. Dwyer’s subsequent penalty kick to the bottom left corner beat Perkins. Sporting KC double their lead in the 34th minute when a Chance Myers low cross evaded everyone but Nagamura at the far post. Nagamura then finished back across goal past a scrambling Perkins. Dwyer added his second in the 64th minute, when Toni Dovale put him through on goal, Dwyer slotted his shot past Perkins. The Vancouver Whitecaps coming off a strong effort by a young squad in a 2-1 mid-week loss in the Amway Canadian Championships to Toronto continued to impress on the road in Columbus improving their record to 4-4-2 with a 1-0 shut out over the Crew. Erik Hurtado scored his first MLS goal in the 37th minute as they won their second straight league match and stretch their unbeaten road streak to four games. The Whitecaps forward controlled a free kick from the opposite half of the field, turned into space and unleashed a drive that left the keeper with no chance. In NASL action FC Edmonton travelled to Indianapolis to face the “11” looking for their first league win of the season after beating the Montreal Impact 2-1 mid-week in Canadian Championship action. All the scoring came in the first half as Edmonton repeated the 2-1 scoreline and improved their record to 1-1-3 in front of a sold out crowd of 10,285 at Michael A. Carroll Stadium. The Eddies opened the scoring in the 24th minute when Daryl Fordyce intercepted a back-pass from an Indy defender to the Indy goalkeeper Kristian Nicht to give the Eddies the 1-0 lead. Less than two minutes later that FC Edmonton doubled their lead off a corner kick Kareem Moses to getting his foot on a bouncing ball it and placing it into the top of the Indy goal. Indy responded quickly in the 30th minute off a free kick when forward Mike Ambersley’s header was deflected off FC Edmonton defender Mallan Roberts. In Ottawa Tampa Bay Rowdies goalkeeper Matt Pickens was the difference in the match stopping an Oliver penalty in the first half and a point blank chance for defender Ramon Soria late in the second as the teams settled for a 1-1 tie. The crowd of 2,164 witness forward Georgi Hristov put the Rowdies ahead with a penalty kick in the 27th minute, but 10 minutes later, midfielder Tony Donatelli equalized for the Fury. Ottawa came closest to finding the winner in the 85th minute when Soria was the benefactor of some fabulous combination play by the Fury and found himself in alone on the Tampa goalkeeper. Pickens responded to the challenge pushing Soria’s shot to safety and preserving the point for Tampa. All five Canadian teams see action this week starting with Wednesday’s second legs of the Canadian Championships when Vancouver hosts Toronto and Edmonton visits Montreal. Both the Eddies and TFC looking to hold on to 2-1 first leg advantages on the road. After their midweek matches Toronto will return home Saturday to host the New York Red Bulls and Montreal will go on the road the same day to play DC United. The New York looking like the first game where TFC may be without World Cup attendees Cesar, Micheal Bradley and possibly Jermain Defoe. 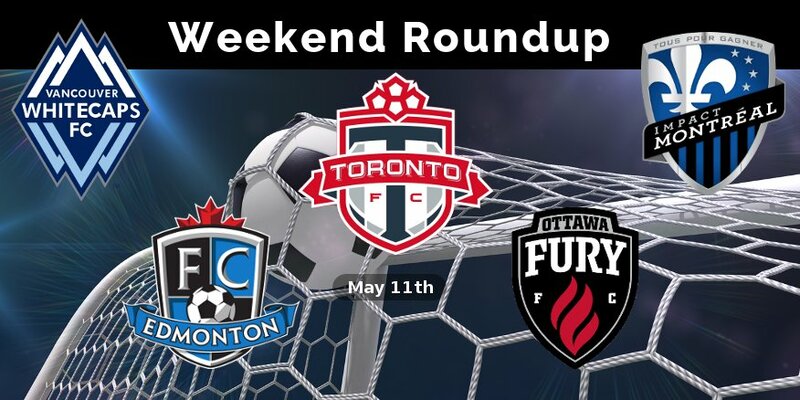 After travelling to Montreal mid-week the Eddies will continue their travels moving on to San Antonio to face the Scorpions while Ottawa will spend their Victoria Day weekend in Indianapolis looking to extend Canadian club success in the Circle City.